From the time I made my reservation, all of my experiences with your staff were pleasant, informative, and warm. Each one of them seemed to be genuinely interested in my experience and that it was a good one. Each person that I spoke with seemed very knowledgeable and friendly. They had no problem answering my questions. Beautiful cabin with amazing view. Best cabin we have stayed in yet. We got to see snow for the first tie. The kids had a blast playing in it and building mini snowmen. We went tot he gem mine, road to nowhere, and traveled the Great Smoky Mountains. We can't wait to visit again. 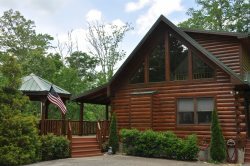 This cabin has great amenities and Close to downtown. My husband and I came up here for a weekend getaway with just us. It was a fantastic trip. Thank you for sharing your cabin with us and we will definitely be bringing the whole family back. The view was stunning and the hot tub was just what we needed for a snowy weekend. Can't wait till out next visit. Wonderful stay with buddies. We saw it snow twice and woke up to a lovely blanket of white covering the earth. We admired it with coffee from the steamy hot tub. Can't wait to come back.